Baseball's already here, and I'm just doing my predictions now? Rest assured that these picks were carefully assembled after much study over the weekend, before the "real" opening day (but after the faux opening day in Australia), and it's only now that I've been able to get to a computer to peck them out. These often-wrong prognostications are something I enjoy doing publicly every year, and sometimes, like last year, my picks aren't half bad (Boston Red Sox, anyone?). Usually I'm way off, but hey, so are most would-be pundits. There's a reason we're not talking about the 2013 World Champion Atlanta Braves. Maybe this is the year I get it right. Without further tarry, here's what I'm pretty sure is going to happen in Major League Baseball in 2014. Commentary follows below. It burns and hurts down to the fiber of my being to pick the Los Angeles Dodgers to smoke my San Francisco Giants in the NL West, and for the potentially even more hated New York Yankees to go all the way to the World Series. Alas, this is the year that certain payrolls really make the difference and pay dividends to owners and fans alike in those cities. I mean really, how long did you think the Yankees would be absent from the Series? At least I have them getting beaten in what could be a quick series in which the Nationals' pitching totally dominates. 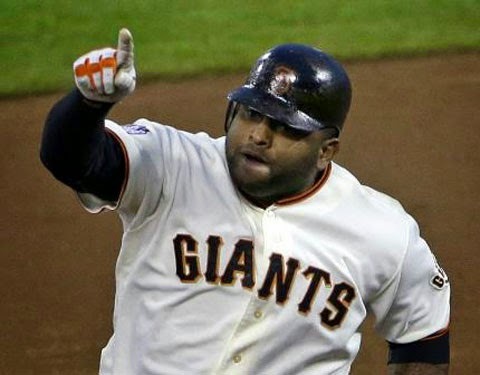 Why is Pablo Sandoval pictured in a preview in which the Giants merely make the Wild Card? Because he's awesome. I'm a big believer in the Kansas City Royals, my favorite American League team. If they're ever going to make it happen, it's right now. I expect everyone to click together and that they'll hold off the Detroit Tigers, whom many have winning the World Series but who I think are due for a major comeuppance. No playoffs in Detroit this year. You know, outside of that and perhaps my elevation of the Yankees, my picks are pretty conventional. Washington is sort of a consensus choice to win it all this year, and no one's betting against the Cardinals, Dodgers and even the A's. I tinkered with the idea of the Anaheim Angels putting it together and making a strong run, but I truly don't think they've got the pitching, and expect even their top two guys (Weaver and Wilson) to fall off this year. Like Detroit, I feel that Texas' day has come and passed, and they'll be contenders but won't be able to unseat the Mighty A's for the third year in a row. Let's both check back in October and see how we did, OK?